Huat Kueh, is how we called this in Hokkien dialect. It simple means “prosperous cake”, literally. That’s the reason most Chinese love eating this auspicious cake. Flavorful, simple and easy to make. Quick easy 1-bowl mixing method. The batter should not be too diluted. 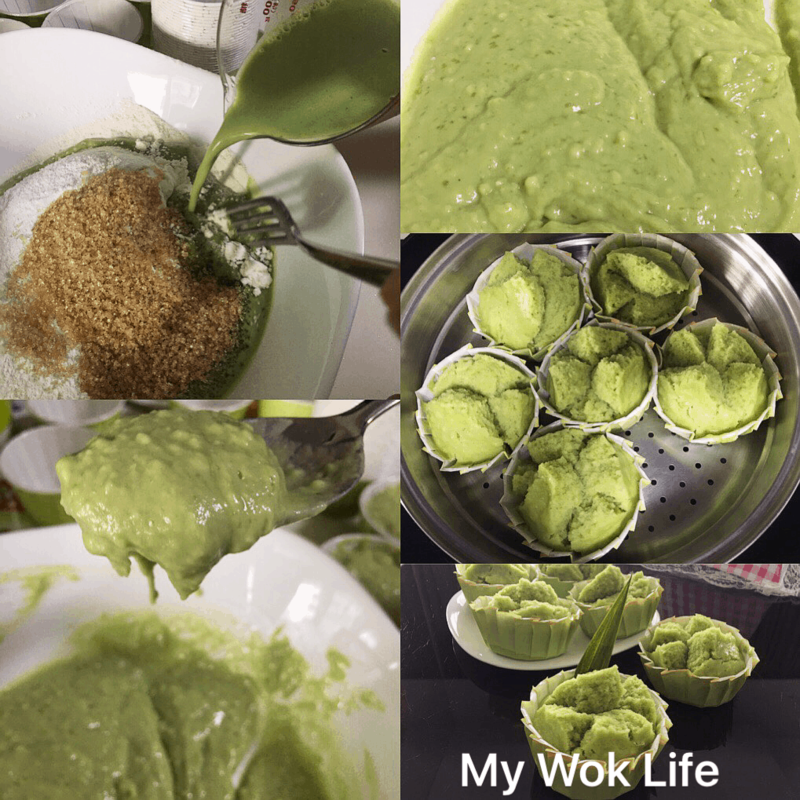 (1) Wash and cut fresh Pandan leaves into small. Place in blender jar together with 100ml of water and blend into juice. Sieve away the leave fiber to retain only Pandan juice of about 110-120ml. Now, mix coconut milk and Pandan juice together in a bowl. Set aside. (2) Mix and sieve together self raising flour, cake flour, baking powder and salt. Add sugar and coconut milk mixture. Use a fork to gently fold all ingredients together. Laddle batter into muffin cups. (3) Preheat steamer or water in wok on high heat. 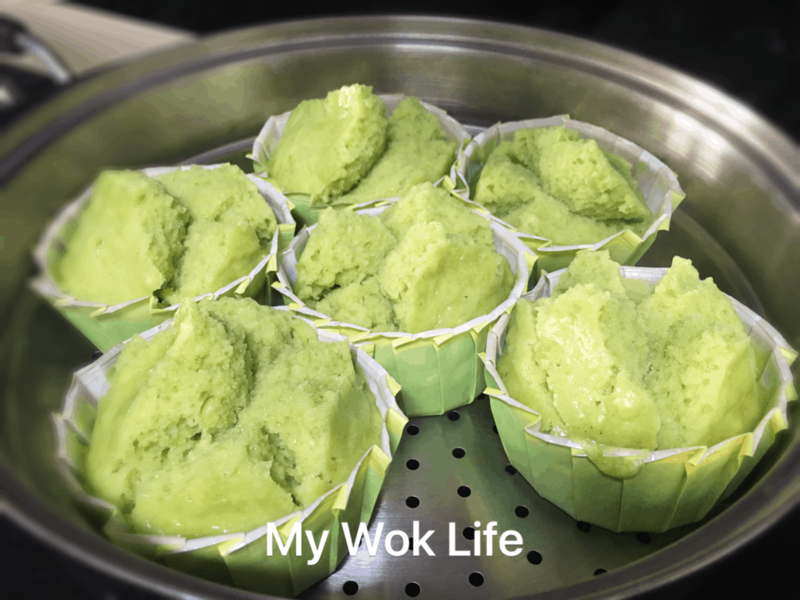 Place the batter cups in only when created enough steam. Steam for 20 minutes. Do not open the lid during the steaming process. Heat off and carefully remove steamed cake from cool outside. Serve with a cup of nice coffee/ tea. 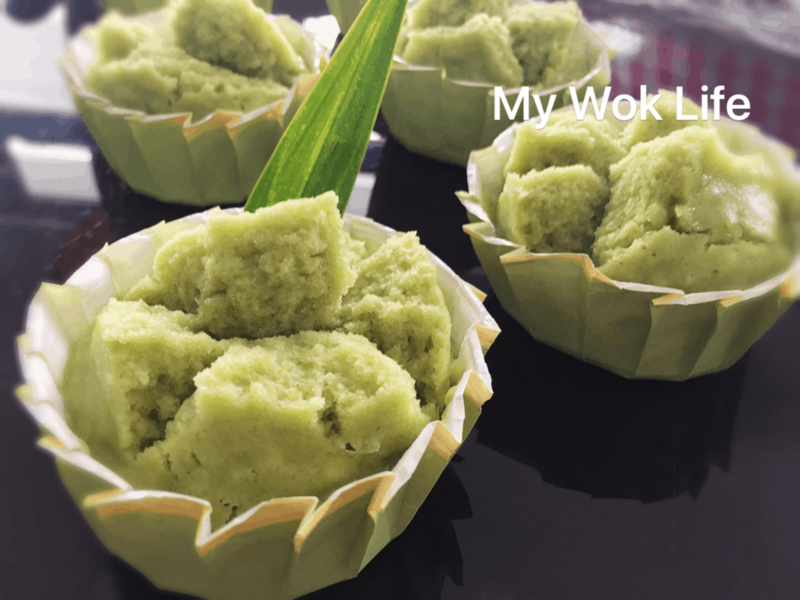 A cup of my Pandan huat kueh counts about 180kcal. Remove from steamer once it’s done to avoid sogginess caused by the condensation. Preparation plus steaming in no more than 30 minutes. 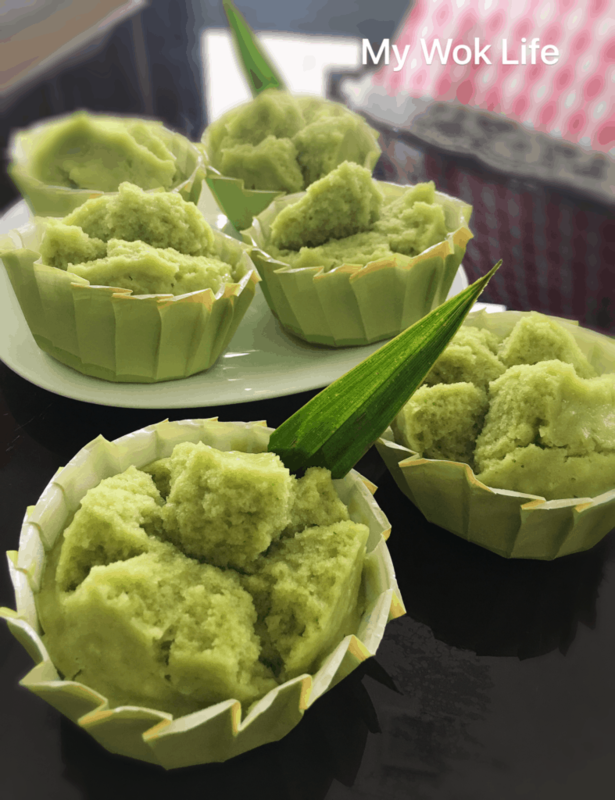 Be reminded that steam the kueh on super high flame, and put the batter cups on the steaming rack only when the steamer is high heated (or water in wok is boiling) as the batter needs the immediate boost from the strong steam to rise. Tips: 100-120ml of Pandan juice is needed in my recipe. 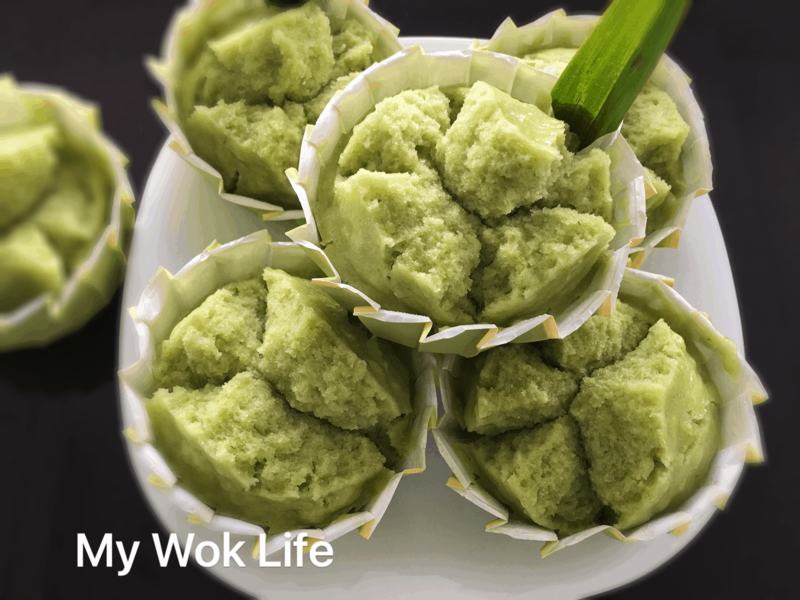 For more intense flavor, you may use more Pandan leaves and adjust the water accordingly. * I used packet coconut milk, bought it off the shelves (Kara’s brand low fat version). My recipe yields high viscosity consistency (see pic). Those chilled coconut milk might taste better, but more watery consistency. So, adjust the addition in the batter. * Look and feel. Always check the consistency of the batter. Steam 5 minutes longer, if batter is more diluted.